Did you know that a snake can lunge and envenom a person for up to an hour after it has been killed? Seriously! What power of darkness is this? I learned that fact when my children were very young. We live in the woods and have taught them the rules about snakes: see snake, run screaming from snake. One day they were bounding down the steps to their cousin’s swing set when my eldest saw one on the path. She stopped the merry procession and called for me. It was a bad one. A fat copperhead stubbornly coiled on a short retaining wall at a child’s eye level. In fact, one of them had passed within a foot of its mouth before they spotted it. There was no angle to use a shovel, so I had to resort to my brother-in-law’s rifle. I am an excellent shot, but don’t own a weapon (Unless you are a criminal or young man with bad intent interested in one of my daughters, then I have an arsenal). Locked, loaded, snake shot nearly in two. Problem solved, right? One would think. I proceeded to use the shovel to move it to the driveway. It was slithering a little, but I didn’t think about it. After all, its head was nearly disconnected from its body. About halfway up the stairs, that broken snake made a desperate lunge for my leg. Luckily, I saw it and dropped the shovel with the snake’s fangs about a half an inch from my calf. I left the minion of evil slithering around itself on the steps for a few hours and made the kids play inside until it could be properly disposed of. The whole thing gave new meaning to the phrase, if it were a snake, it would have jumped up and bitten you. There was another snake this week. Its camouflage was perfect and it came out of nowhere to bite me. I can see most relevant dates on the calendar and predict their emotional impact in this season of grief – any holiday, her birthday, the anniversary of diagnosis and certainly the date of her death will be forever marked with a big red X on the calendar. The first day of school lay hidden in the weeds and bit me hard Monday. Eight years ago, we took Kylie to first grade. 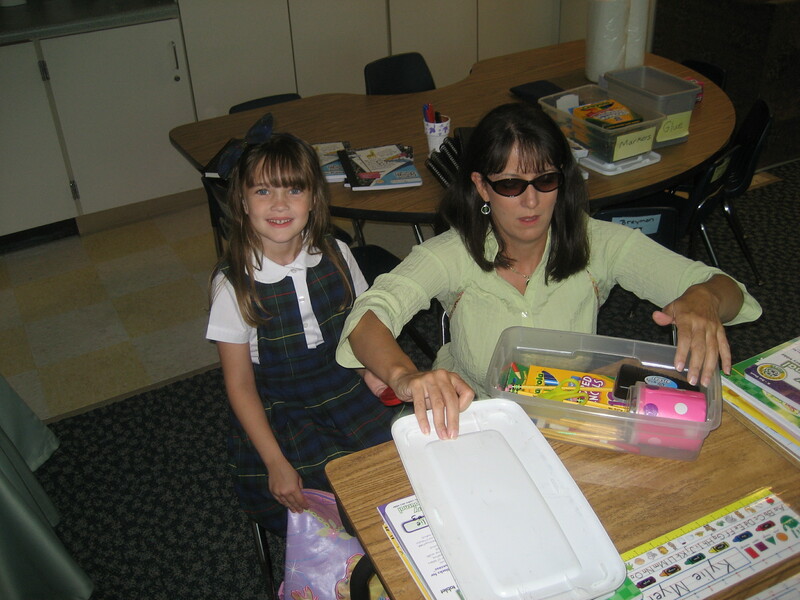 Mommy had to wear sunglasses so the others wouldn’t see her tears. It seemed that Kylie’s classmates were all first children while she was the youngest of four. Some of the kids cried and held onto their mommy’s legs. In our case, quite the opposite was true. The younger parents must have thought us an old couple who had pleaded for a child (ala Abraham & Sarah) as we unpacked her, said goodbye, and sat on a bench outside the classroom while mommy wept. Leaving her there meant being at home alone and mommy likes having her little eaglets in the nest. Last year, Kylie bravely fought to be at school. She was sick and exhausted from chemo but determined to be there. Mommy sat nearby that day as well, in case she needed to go home early. Last Monday should have been her last “first day” at our beloved Perimeter Christian School. She should be the big kid there – an 8th grader. We should have gone back-to-school shopping in the previous weeks, and if treatment had gone as planned, she should have had hair. She should have been able to walk the halls on her own. We should have taken pictures of the reunion with her classmates and hugs with teachers. We should have had more. Kylie deserved more. The first day of school pictures Monday were just like that snake lunging at me – only this snake connected. I don’t begrudge anyone posting them. The pictures are part of the routine – the parents and children deserve that routine despite the effect it might have on me. It is just hard to see normal. Cancer stole normal. And yet… I love those kids and that place. Once I dropped the shovel, I found a great deal of pleasure in seeing how much they’d grown and remembering how well they loved my little girl. Kylie’s friends are starting to look like little adults and their beautiful smiles slowly won the day. I know there are bad snakes lying in wait, but I have learned that there are good snakes also. While some don’t agree, one year I killed two large non-venomous snakes, and the next year my problems with the bad ones doubled. You see, good snakes eat bad snakes. The only surefire way to shed myself of my snake problem is to never go into the woods. Here’s the rub: I love walking in the woods. There are so many good things in the woods that I won’t allow the occasional bad snake to ruin the pleasure of a hike among the trees. It may just take time and a couple of good snakes to nudge me back on the path. Your words are so meaningful, I wish Kylie was here for her first last day of school. I pray that in time more and more good snakes will eat those bad snakes. Praying for you always. Actually her last first day of school :0). I definitely don’t have a way with words like you do! Lovely insight. Kylie made you the person you are/have become, her birth and the joy, her death and the pain. My Katie graduated from high school on the 3rd and died on the 13th. But she graduated. Wishing you peace. Blessings & JOY! I’m sorry for your loss Kristi. What an accomplishment to graduate going through that challenge. Dearest Myers Family, I was bitten by the snake on Monday too. You see, when my new class this year went to set up their lockers, I heard one girl say, “Mrs. Sams, there’s already stuff in my locker.” As I approached her locker and looked in, my heart cracked, my breath caught, and I immediately prayed I would not cry. You see, in all the grief of last year, we forgot to clean out Kylie’s locker. There sat her pencil box, and other supplies, but then I saw her Bible. The Word of the Lord that had sustained her and that she now understands clearly. Pages with her little notes and underlinings. I just held her things for a few minutes, trying to feel her presence and of course, remembering her smile. It was a bad snake bite, but I also know Who has the anti-venom. Praying for you still and always. Boy. I’ve had, maybe, an irrational fear of serpents all my life. Was bit by a big King Snake when I was little (remember the days when we never wore shoes in the summer?). But this Cancer Snake is the worst, isn’t it? We (I was about to say lost, but I know where he is) mourn the death of our middle baby, Michael Thomas, at each anniversary, too. It’s hard not to when you remember those wonderful days of “normal.” Heck, I would even take ANY of the days of not-so-normal when I sat in one of those sticky, slick vinyl chairs in the hospital with him. He battled leukemia from age 11 until he met Jesus almost 2 years ago on Aug. 29, 2013. Forever he will be 17. On the cusp of adulthood although he truly had seemed older, wiser and more mature (whatever that is?) since he put up with all the mess of cancer. I have long followed your Kylie’s (always smiling) story. Please know I will continue to pray for you and all of us who are navigating this road less taken. Thank you for your prayers and I’m sorry for the loss of Michael Thomas. Cancer snakes are the worst kind! Mrs. Sam’s (Myer’s Family), that’s a God thing. Kylie didn’t miss her first day of school!! She will always be present, in each and every one of your hearts!! I cried on the way to school Monday thinking of Kylie and not starting the year with her. Emily was so excited to have her in class last year. She loved the privilege of wheeling her around. Will never forget their big smiles as they came off the elevator that day rushing to the next class. We missed her Monday and you guys. Monday, last night and this year will not be the same without her or you guys! You all are greatly missed! Thank you. That was a special day and she loved being there. so well said. i love the metaphor. hugs to all of you. except for the bad snakes. I thought of you the other day when a friend mentioned meeting someone from the upper peninsula of Michigan. Confirmed your statement that they are their own breed.. So beautiful. Your words and Kylie. I wondered if you would write about this. I had my own snake moment on Monday as I went to registration for my younger son and realized I would never be doing that for Jonathan again. Thanks for putting my feelings into words more than once! I hope Jonathan and Kylie have met–I am sure they would get along famously ! Sorry for your loss. I’m sure they are having a ball though! You know that there will be tweaks and twangs and downright thuds on the heart strings for occasions like birthday’s and Christmas but there will also be those blind siding ones like this too…hugs to you my friend. I know that, but I walk along pretty aimlessly and don’t see them coming. Thanks for the hugs… can always use those. Beautiful words and so unfair that your Kylie is not here. I know it must be a terrible pain to deal with and I know your heart will always be missing a beat without her. There are so many ugly people that are still walking the planet, uggg, and she was so beautiful in everyway and now she’s on the other side. Truly disgusting and maddening. Take comfort in knowing how she loved you, and what an influence you had on her life, and she was always surrounded by so much love from you all. The hard thing to swallow as a parent is that you couldn’t save her from the snake, and that is maddening and horrific and the awful venom of the snake is still like a lump in your chest. But as young as she was, she knew you were doing everything you could to make her better, she adored you, and one day she will be with you again and what a day that will be. Thank you for stopping by and reading. I appreciate it. I’m so sorry for what your niece had to go through and is still dealing with. It is truly a bad situation that shouldn’t exist for these kids. Thank you for pointing that out. Although we lost, I am a big fan of survivors and hope the work we are doing in Kylie’s name makes many more survivors. Seems like there is always a moment or situation when we have lost so much. We will go on though. There is no other choice Mark. Blessings to you and your family and may all her friends continue to encourage and bless your families life and memories of your precious daughter.